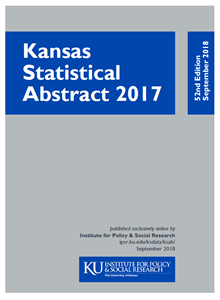 The Kansas Statistical Abstract 2017, contains the latest available state, county, and city-level data for Kansas on population, vital statistics and health, housing, education, business and manufacturing, exports, employment, income, finance, state and local government, crime, recreation, communications, transportation, agriculture, climate, and energy and natural resources. The Kansas Statistical Abstract is a PDF file and will require Adobe Acrobat Reader (free software available at http://www.adobe.com). This site contains statistical and financial data compiled by researchers at the University of Kansas from federal, state, and local data sources, and has not been prepared or maintained as a source of investor information and should not be relied upon for investment purposes. Investor information regarding State bonds is available at http://emma.msrb.org. Please note that KSAs 1965-2000 are scanned copies of the printed publication and therefore are larger files. Kansas Statistical Abstract 2015 (50th Edition - 27.0M PDF) Also see the StoryMap on the history of the KSA.